This article is about starting up the engine manually. 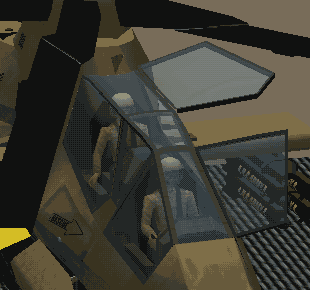 By default the engines are already running when entering the helicopter, so you don't have to startup the engines yourself. To make the helicopter start with engines off, so that you have to start them yourself you have to change a value in eech.ini. Where x can be 0 (off) or 1 (on). 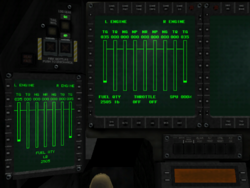 Before you can start the engines you have to power up the avionics so that you can see what's happening. 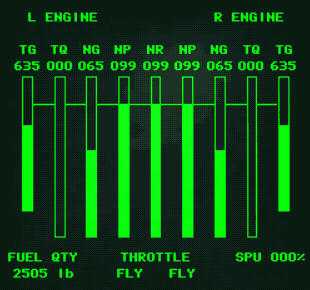 The Comanche's engine screen is shown on the outer left MFD screen, but this is not as integral as it is shown on the main left MFD. Note that Secondary Power Unit (SPU) is also referred to as the Auxiliary Power Unit (APU). The outer left MFD (left) and the main left MFD (right). 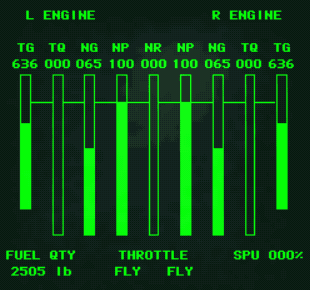 Press CTRL + [ to put the engine screen on the left MFD-screen. 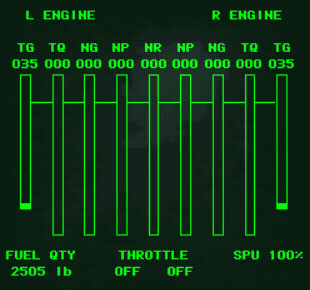 The engine MFD before any input. Press CTRL + / to start up the secondary power unit (SPU). The SPU will reach 100%. The SPU (bottom right) at 100%. 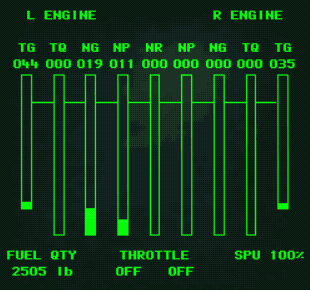 Press R to disengage the rotor brakes. The rotor brakes (left green light) still on. Press CTRL + , to engage the left engine starter. The left engine running by the SPU. 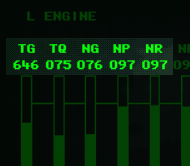 When the left engine runs stable powered by the SPU (above 15% NG RPM). Ignite the engine by pressing , twice. 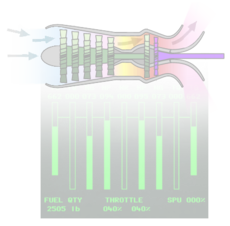 The engine temperature will increase fast, and engine RPM will slowly increase. The left engine runs by it self, now. The main rotor starts spinning once engine RPM is sufficient. The main rotor (center bar) at full speed. Repeat step 3 and 4 for the right engine. Use . (instead of ,) for the right engine. When both engines run, the SPU will shut itself down. Now, both engines runs by themselves, and the SPU has shut down. Press , and . simultaneously to throttle up both engines. Increase it until it hits the "fly" position. 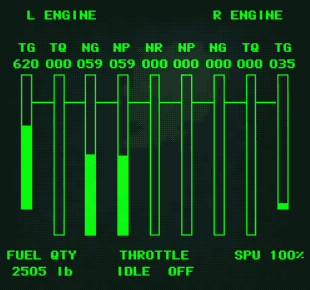 Throttle (bottom middle) at 40%. Throttle in the fly position. While the rotor is spinning up, close the canopy doors by pressing ALT + C.
The canopy doors are still open. When the rotor RPM reaches 90%, the RPM caution light turns off. The RPM light still on. The RPM light is off. Now, you are ready to take off. Increase collective to get airborne. To put the engine screen on the left MFD-screen. Start up the secondary power unit (SPU). Wait till the SPU will reaches 100%. Engage the left engine starter. Ignite the engine (when the left engine RPM is above 15%). 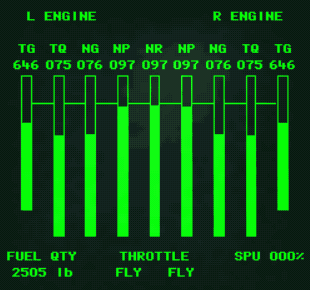 Repeat the 2 previous steps for the right engine. After the right engine runs, the SPU will shut itself down. 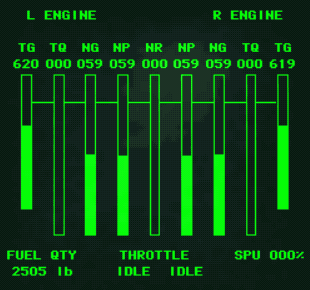 Throttle up the engines. Increase it untill it hits the "fly" position. Disengage the rotor brakes. The main rotor starts spinning. Wait till the rotor RPM caution light turns off. Increase collective to get airborne. The engine keys as shown on the keycard. This page was last modified on 10 March 2009, at 14:33.